Tepper says stocks are cheap based on the Fed model. How predictive is the Fed model? Let’s now take a look at the facts. The chart [above] shows the weighted average of the twenty-nine models for the one-month-ahead equity risk premium, with the weights selected so that this single measure explains as much of the variability across models as possible (for the geeks: it is the first principal component). The value of 5.4 percent for December 2012 is about as high as it’s ever been.The previous two peaks correspond to November 1974 and January 2009. Those were dicey times. By the end of 1974, we had just experienced the collapse of the Bretton Woods system and had a terrible case of stagflation. January 2009 is fresher in our memory. Following the collapse of Lehman Brothers and the upheaval in financial markets, the economy had just shed almost 600,000 jobs in one month and was in its deepest recession since the 1930s. It is difficult to argue that we’re living in rosy times, but we are surely in better shape now than then. The assumed one-to-one correspondence between forward earnings yields and 10-year Treasury yields is a statistical artifact of the period from 1982 to the late 1990’s, during which U.S. stocks moved from profound undervaluation (high earnings yields) to extreme overvaluation (depressed earnings yields). 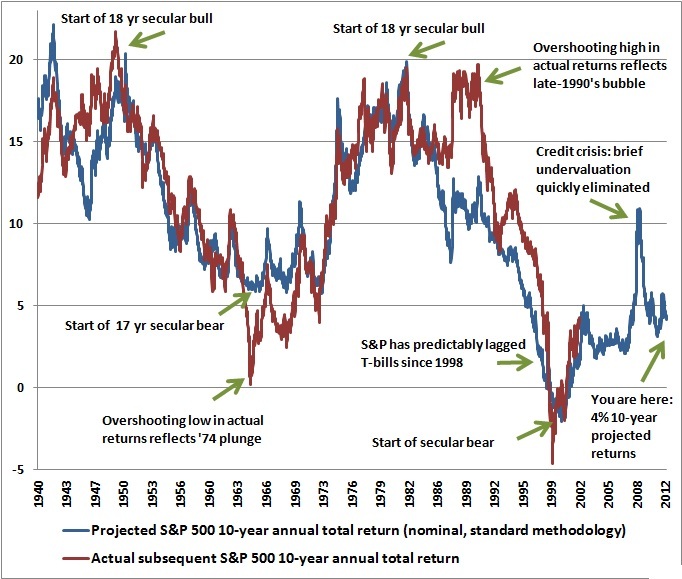 The Fed Model implicitly assumes that stocks experienced only a small change in “fair valuation” during this period (despite the fact that stocks achieved average annual returns of nearly 20% for 18 years), and attributes the change in earnings yields to a similar decline in 10-year Treasury yields over this period. Unfortunately, there is nothing even close to a one-to-one relationship between earnings yields and interest rates in long-term historical data. Why doesn’t Wall Street know this? Because data on forward operating earnings estimates has only been compiled since the early 1980’s. There is no long-term historical data, and for this reason, the “normal” level of forward operating P/E ratios, as well as the long-term validity of the Fed Model, has remained untested. … [T]he profile of actual market returns – especially over 7-10 year horizons – looks much like the simple, humble, raw earnings yield, unadjusted for 10-year Treasury yields (which are too short in duration and in persistence to drive the valuation of stocks having far longer “durations”). On close inspection, the Fed Model has nearly insane implications. For example, the model implies that stocks were not even 20% undervalued at the generational 1982 lows, when the P/E on the S&P 500 was less than 7. Stocks followed with 20% annual returns, not just for one year, not just for 10 years, but for 18 years. Interestingly, the Fed Model also identifies the market as about 20% undervalued in 1972, just before the S&P 500 fellby half. And though it’s not depicted in the above chart, if you go back even further in history, you’ll find that the Fed Model implies that stocks were about as “undervalued” as it says stocks are today – right before the 1929 crash. Yes, the low stock yields in 1987 and 2000 were unfavorable, but they were unfavorable without the misguided one-for-one “correction” for 10-year Treasury yields that is inherent in the Fed Model. It cannot be stressed enough that the Fed Model destroys the information that earnings yields provide about subsequent market returns. The chart below presents the two versions of Hussman’s calculation of the equity risk premium along with the annual total return of the S&P 500 over the following decade. … [T]he correlation of “Fed Model” valuations with actual subsequent 10-year S&P 500 total returns is only 47% in the post-war period, compared with 84% for the other models presented above [Shiller PE with mean reversion, dividend model with mean reversion, market capitalization-to-GDP]. In case one wishes to discard the record before 1980 from the analysis, it’s worth noting that since 1980, the correlation of the FedModel with subsequent S&P 500 total returns has been just 27%, compared with an average correlation of 90% for the other models since 1980. Ditto, by the way for the relationship of these models with the difference between realized S&P 500 total returns and realized 10-year Treasury returns. Still, maybe the Fed Model is better at explaining shorter-term market returns. Maybe, but no. It turns out that the correlation of the Fed Model with subsequent one-year S&P 500 total returns is only 23% – regardless of whether one looks at the period since 1948 (which requires imputed forward earnings since 1980), or the period since 1980 itself. All of the other models have better records. Two-year returns? Nope. 20% correlation for the Fed Model, versus an average correlation of 50% for the others. Over time, Fed Model adherents are likely to observe behavior in this indicator that is much more like its behavior prior to the 1980’s. Specifically, the Fed model will most probably creep to higher and higher levels of putative “undervaluation,” which will be completely uninformative and uncorrelated with actual subsequent returns. The popularity of the Fed Model will end in tears. The Fed Model destroys useful information. It is a statistical artifact. It is bait for investors ignorant of history. It is a hook; a trap. Hussman wrote that in August 2007 and he was dead right. He still is. The deficit of one sector must emerge as the surplus of another sector. Corporations benefit from deficit spending despite wages at record lows as a share of economy. Hussman’s whole talk is well worth hearing. [F]rom 1951 on, the percentage settled down pretty much to a 4% to 6.5% range. In my opinion, you have to be wildly optimistic to believe that corporate profits as a percent of GDP can, for any sustained period, hold much above 6%. One thing keeping the percentage down will be competition, which is alive and well. — Jeremy Grantham, Barron’s (c. 2006), via Katsenelson, The Little Book of Sideways Markets. In general, elevated profit margins are associated with weak profit growth over the following 4-year period. The historical norm for corporate profits is about 6% of GDP. The present level is about 70% above that, and can be expected to be followed by a contraction in corporate profits over the coming 4-year period, at a roughly 12% annual rate. This will be a surprise. It should not be a surprise. Historically, nominal GDP growth, corporate revenues, and even cyclically-adjusted earnings (filtering out short-run variations in profit margins) have grown at about 6% annually over time. Excluding the bubble period since mid-1995, the average historical Shiller P/E has actually been less than 15. Therefore, it is simple to estimate the 10-year market return by combining three components: 6% growth in fundamentals, reversion in the Shiller P/E toward 15 over a 10-year period, and the current dividend yield. It’s not an ideal model of 10-year returns, but it’s as simple as one should get, and it still has a correlation of more than 80% with actual subsequent total returns for the S&P 500. 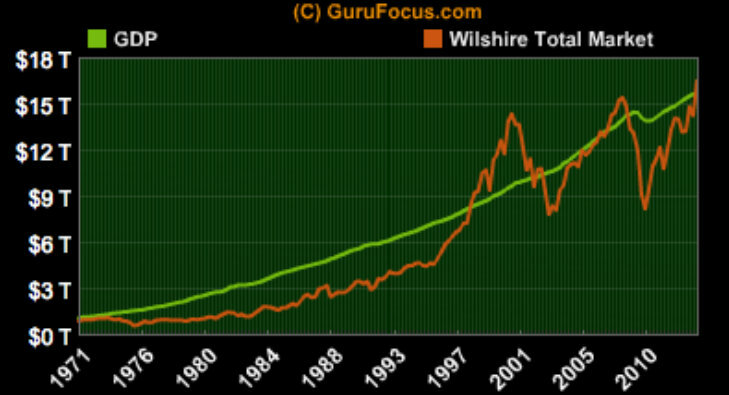 For example, at the 1942 market low, the Shiller P/E was 7.5 and the dividend yield was 8.7%. The shorthand estimate of 10-year nominal returns works out to 1.06*(15/7.5)^(1/10)-1+.087 = 22% annually. In fact, the S&P 500 went on to achieve a total return over the following decade of about 23% annually. Conversely, at the 1965 valuation peak that is typically used to mark the beginning of the 1965-1982 secular bear market, the Shiller P/E reached 24, with a dividend yield of 2.9%. The shorthand 10-year return estimate would be 1.06*(15/24)^(1/10)+.029 = 4%, which was followed by an actual 10-year total return on the S&P 500 of … 4%. Let’s keep this up. At the 1982 secular bear low, the Shiller P/E was 6.5 and the dividend yield was 6.6%. The shorthand estimate of 10-year returns works out to 22%, which was followed by an actual 10-year total return on the S&P 500 of … 22%. Not every point works out so precisely, but hopefully the relationship between valuations and subsequent returns is clear. Now take the 2000 secular bull market peak. The Shiller P/E reached a stunning 43, with a dividend yield of just 1.1%. The shorthand estimate of 10-year returns would have been -3% at the time, and anybody suggesting a negative return on stocks over the decade ahead would have been mercilessly ridiculed (ah, memories). But that’s exactly what investors experienced. The problem today is that the recent half-cycle has taken valuations back to historically rich levels. Presently, the Shiller P/E is 22.7, with a dividend yield of 2.2%. Do the math. A plausible, and historically reliable estimate of 10-year nominal total returns here works out to only 1.06*(15/22.7)^(.10)-1+.022 = 3.9% annually, which is roughly the same estimate that we obtain from a much more robust set of fundamental measures and methods. Simply put, secular bull markets begin at valuations that are associated with subsequent 10-year market returns near 20% annually. By contrast, secular bear markets begin at valuations like we observe at present. It may seem implausible that stocks could have gone this long with near-zero returns, and yet still be at valuations where other secular bear markets have started – but that is the unfortunate result of the extreme valuations that stocks achieved in 2000. It is lunacy to view those extreme valuations as some benchmark that should be recovered before investors need to worry. Note that there are a few points where the estimate of prospective market returns would have differed from the actual market returns achieved by the S&P 500 over the following decade. These deviations happen to be very informative. When actual returns undershoot the estimate from a decade earlier, it is almost always because stocks have moved to significant undervaluation. When actual returns overshoot the estimate from a decade earlier, it is almost always because stocks have moved to significant overvaluation. Note the overshoot of actual market returns (versus expected) in the decade since 2002. The reason for this temporary overshoot is clear from the chart at the beginning of this weekly comment: the most recent 10-year period captures a trough-to-peak move: one full cycle plus an unfinished bull half-cycle. While Hussman’s formula is exceedingly simple, with a correlation of more than 0.8 it’s also highly predictive. It’s currently estimating very attenuated returns, and investors should take note. My piece on S&P 500 forward earnings estimates and the overvaluation of the market generated a number of heated emails and comments. I didn’t know that it was so controversial that the market is expensive. I’m not saying that the market can’t continue to go up (I’ve got no idea what the market is going to do). My point is that there are a variety of highly predictive, methodologically distinct measures of market-level valuation (I used the Shiller PE and Tobin’s q, but GNP or GDP-to-total market capitalization below work equally as well) that point to overvaluation. From an investment standpoint, it’s important to recognize that virtually every assertion you hear that “stocks are reasonably valued” is an assertion that rests on the use of a single year of earnings as a proxy for the entire long-term stream of future corporate profitability. This is usually based on Wall Street analyst estimates of year-ahead “forward operating earnings.” The difficulty here is that current profit margins are 70% above the long-term norm. Most important, the level of corporate profits as a share of GDP is strongly and inversely correlated with the growth in corporate profits over the following 3-4 year period. [T]he market value of all publicly traded securities as a percentage of the country’s business–that is, as a percentage of GNP… has certain limitations in telling you what you need to know. Still, it is probably the best single measure of where valuations stand at any given moment. And as you can see, nearly two years ago the ratio rose to an unprecedented level. That should have been a very strong warning signal. GDP in Q4 2012 stood at $15,851.2 billion. GNP at Q3 2012 (the last data point available) stood at $16,054.2 billion. For our present purposes, one substitutes equally as well for the other. The current ratio of total market capitalization to GNP is 16,461.52 / 16,054.2 or 103 percent. 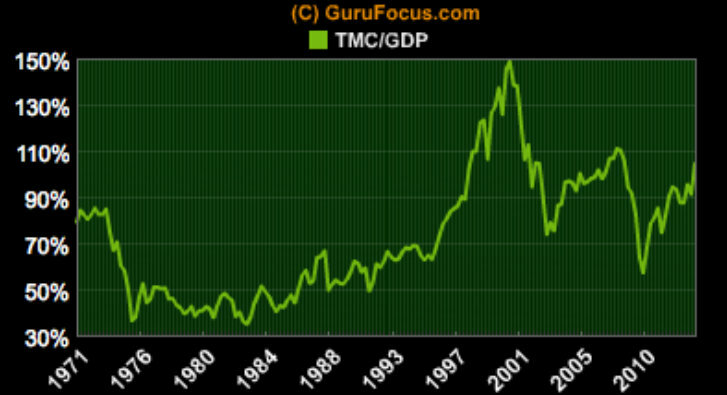 The current ratio of total market capitalization to GDP is 16,461.52 / 15,851.2 or 104 percent. 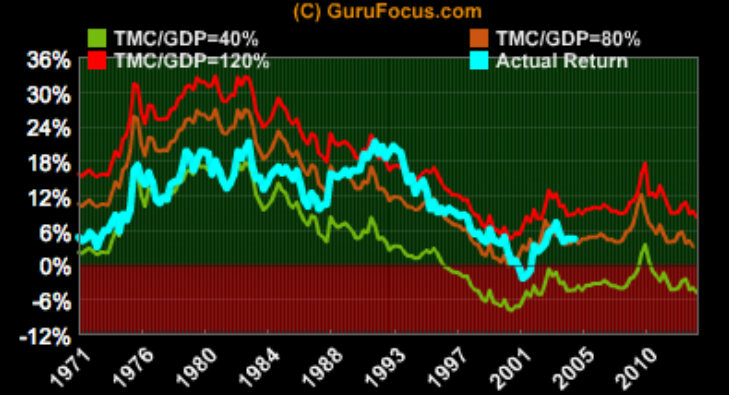 Chart 1 demonstrates that total market capitalization has now exceeded GDP (note the other two auspicious peaks of total market capitalization over GDP in 1999 and 2007). Chart 2 shows that the current ratio is well below the ratio achieved in the last two peaks (1999 and 2007), but well above the 1982 stock market low preceding the last secular bull market. But, so what? Is the ratio of total market capitalization to GDP predictive? Notably, the market value of U.S. equities relative to GDP – though not as elevated as at the 2000 bubble top – is not depressed by any means. On the contrary, since the 1940’s, the ratio of equity market value to GDP has demonstrated a 90% correlation with subsequent 10-year total returns on the S&P 500 (see Investment, Speculation, Valuation, and Tinker Bell), and the present level is associated with projected annual total returns on the S&P 500 of just over 3% annually. A terminal ratio of 120 percent (equivalent to the 1999 to 2001 peak) leads to annualized nominal returns of 8.1 percent over the next 10 years. A terminal ratio of 80 percent (the long-run average) leads to annualized nominal returns of 3 percent over the next 10 years. A terminal ratio of 40 percent (approximating the 1982 low of 35 percent) leads to annualized nominal returns of -5 percent over the next 10 years. For me, the message of that chart is this: If the percentage relationship falls to the 70% or 80% area, buying stocks is likely to work very well for you. If the ratio approaches 200%–as it did in 1999 and a part of 2000–you are playing with fire. As of today, the Total Market Index is at $ 16461.5 billion, which is about 104.3% of the last reported GDP. The US stock market is positioned for an average annualized return of 3%, estimated from the historical valuations of the stock market. This includes the returns from the dividends, currently yielding at 2%. The tour we’ve taken through the last century proves that market irrationality of an extreme kind periodically erupts–and compellingly suggests that investors wanting to do well had better learn how to deal with the next outbreak. What’s needed is an antidote, and in my opinion that’s quantification. If you quantify, you won’t necessarily rise to brilliance, but neither will you sink into craziness. 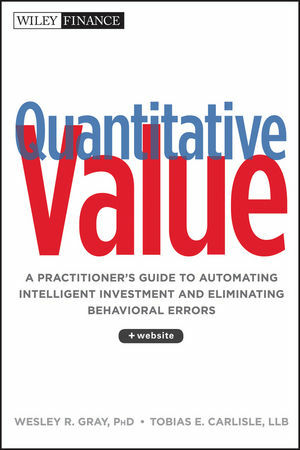 On a macro basis, quantification doesn’t have to be complicated at all. Below is a chart, starting almost 80 years ago and really quite fundamental in what it says. The chart shows the market value of all publicly traded securities as a percentage of the country’s business–that is, as a percentage of GNP. The ratio has certain limitations in telling you what you need to know. Still, it is probably the best single measure of where valuations stand at any given moment. And as you can see, nearly two years ago the ratio rose to an unprecedented level. That should have been a very strong warning signal. The current ratios of total market capitalization to GNP and GDP should be very strong warning signals. Further, that they imply similar returns to the Shiller PE and Tobin’s q, suggests that they are robust. How to estimate the long-term return on stocks: What does the future hold? Yesterday I looked at John Hussman’s method for estimating the long-term returns on stocks. The long-term return on a security consists of two parts: income (from dividends or interest payments), and capital gains (from price changes). For any future stream of income, the higher the price you pay , the lower the annual rate of return you will earn. Here’s my calculation. If I assume a dividend growth rate of 6 percent (about the long-run average*), the current S&P 500 dividend yield of 2.1 percent (from multpl.com), a terminal S&P 500 dividend yield of 4 percent (Hussman says that the dividend yield on stocks has historically averaged about 4 percent), the expected nominal return over ten years is 2.4 percent annually. If I use multpl.com‘s mean and average long-term S&P 500 dividend yields of 4.46 and 4.39 percent respectively it gets uglier still, so I’m not going to bother. Over 20 years the nominal return rises to 5.7 percent, and over 30 years 6.8 percent. As a rule of thumb, a 1% market decline in a short period of time tends to increase the prospective 10-year return, not surprisingly, by about 0.1%. 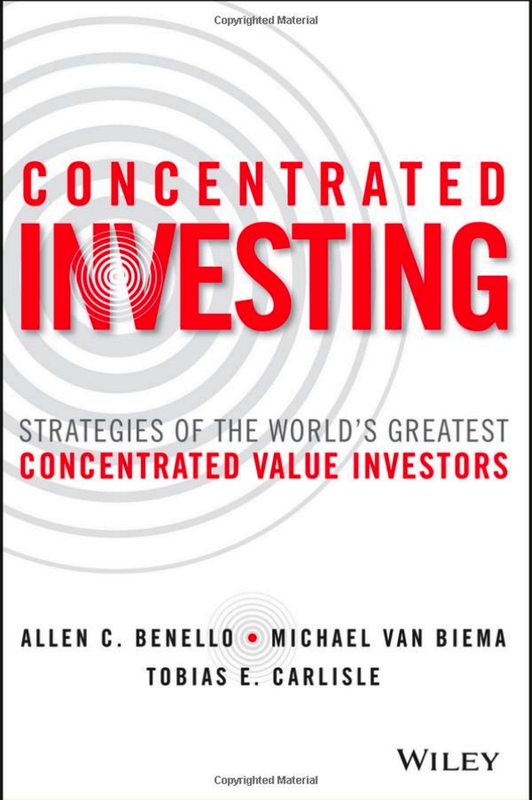 However, that approximation is less accurate over large movements or over extended periods of time, where growth in fundamentals and compounding effects become important. I’ve got no idea why my calculation differs from Hussman’s. I’m all ears if anyone has any suggestions. Either way, even with outrageously bullish assumptions, 5.2 percent is not a great return. It’s about half the historical return of 10 percent. There are other methods of calculating expected returns that I’ll look at tomorrow. Historically, earnings, dividends, revenues, book values and other stock market fundamentals have grown at a rate of 6% annually. Earnings are the most volatile of these, sometimes growing from trough-to-peak at rates approaching 20% annually, and sometimes plunging from peak-to- trough at rates approaching -20% annually. In fact, historically, earnings have been even more volatile than prices themselves. When measured from peak-to-peak or trough-to-trough however, earnings show exactly the same sturdy 6% annual growth rate that other stock market fundamentals exhibit. Over the past century, the highest growth rates over any 30-year period were 6.3% annually for dividends, and 7.8% for earnings (trough to peak).